Ends up, there’s a simple way to set up Quicksilver to trigger your bookmarklets ultra-fast, at least in Chrome and likely in other major browsers like Safari and Firefox. While the bookmarklets themselves work fine, this Quicksilver trick doesn’t seem to be working in Safari or Firefox for me right now. This may just be because I have Chrome set as my default browser. If anyone wants to check and let me know, please post in the comments. Here’s the setup. Again in QS preferences, go to Catalog (up top), Plugins (on the left), and make sure Chrome’s bookmarks are being indexed by QS. The box should be checked with the number of indexed items next to the checkbox. In Chrome, go to a page you’d like to use with your bookmarklet. That’s all there is to it! Worked like a charm for me. Now, for a few bonus points, we can make this process even faster. You can set up Quicksilver to recognize a different action for a capital letter versus lower case. This makes it so I can trigger any bookmarklet (whichever is in the first pane) faster. For your favorite bookmarklets, you can set up a special trigger that only runs one specific bookmarklet. 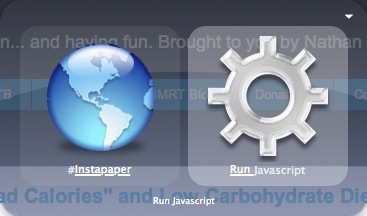 Again in Quicksilver preferences, go to Triggers (up top). Click the “+” down bottom to add a new trigger. Afterwards, select the trigger and click the “i” in the bottom right. In the sidepane, pick an unused hotkey combination. I also recommend clicking on “Scope” (in the same sidebar) and limiting this trigger to your primary browser. This prevents this hotkey combination from getting in the way accidentally. Okay, that’s all for this post. Find it useful? Have a problem? Let me know in the comments section below! *Did you even know Google Bookmarks existed? Pretty awesome way to save / organize / tag / add notes to links that you don’t need everyday but want to be able to find later.